Family portrait in Seattle with views of downtown and just a hint of Mt. Ranier in the distance. 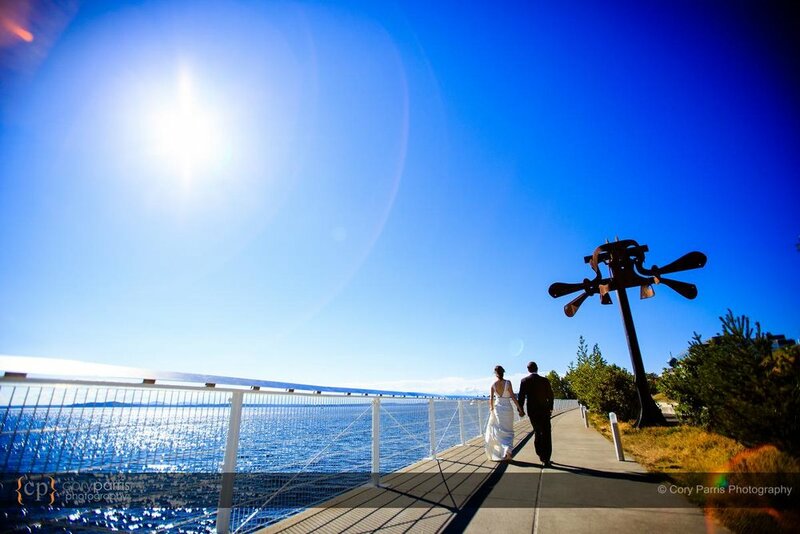 Jenny and Jesse had a beautiful day for a wedding at the Seattle Aquarium. 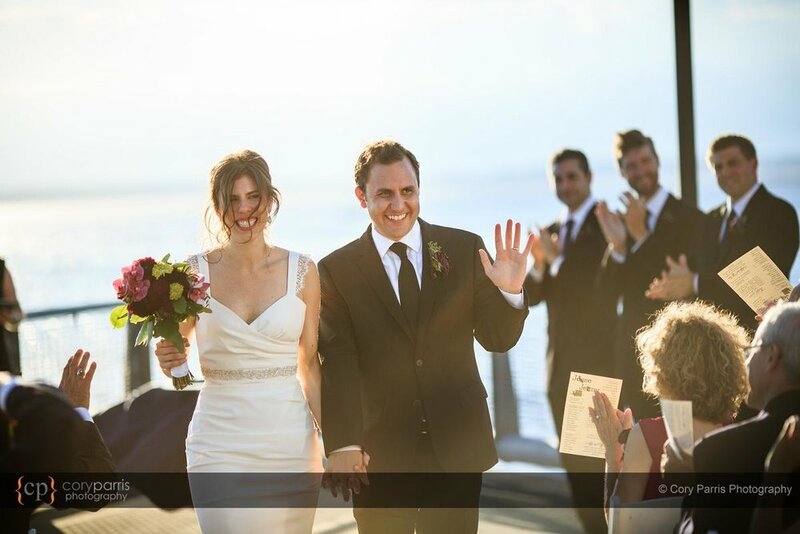 They are a very funny couple with hilarious friends and family. It was a blast! 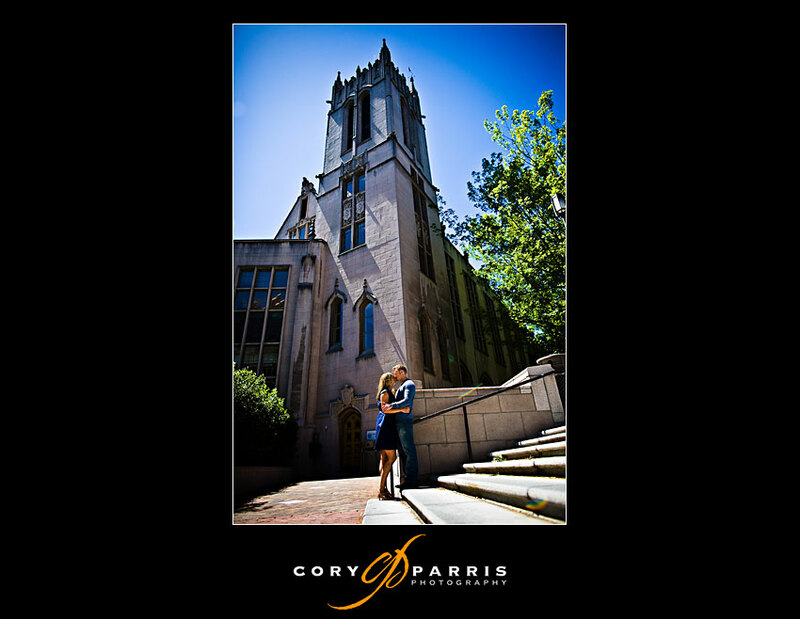 Another image at Myrtle Edwards Park. I used a bit of flash for this one. 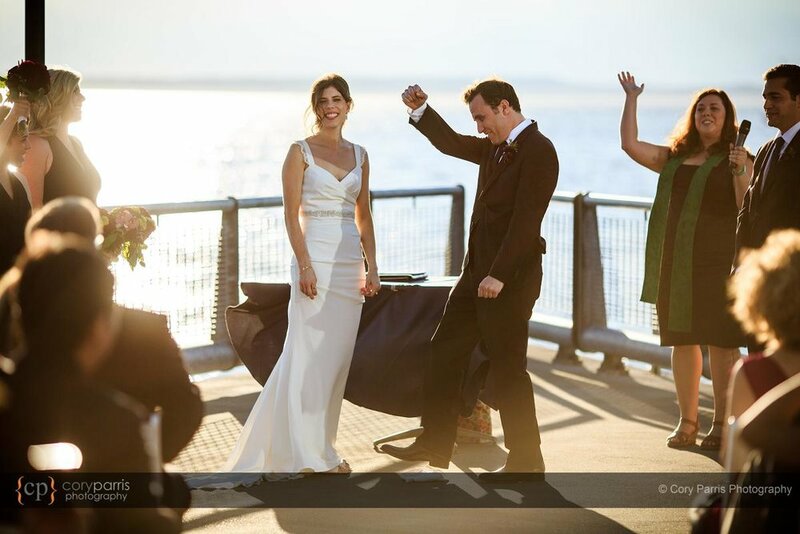 Getting married on the pier behind the Seattle Aquarium. I love the Seattle waterfront. 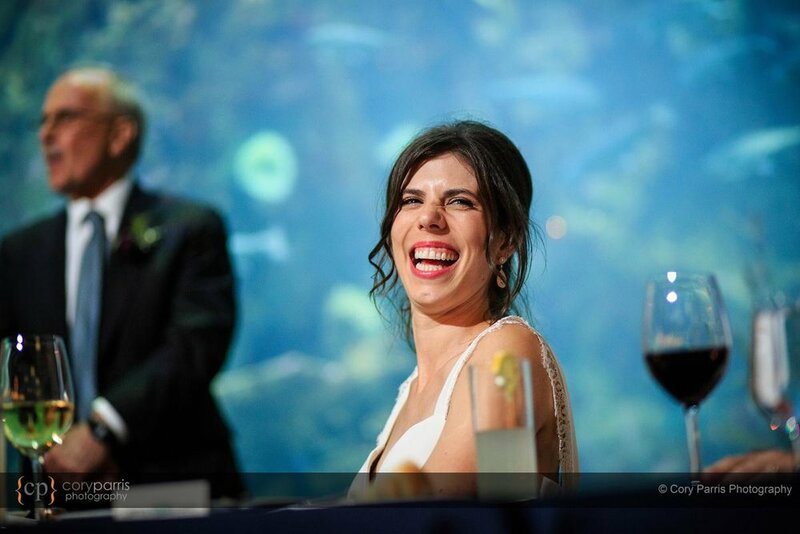 Jenny and Jesse laughing during their vows. 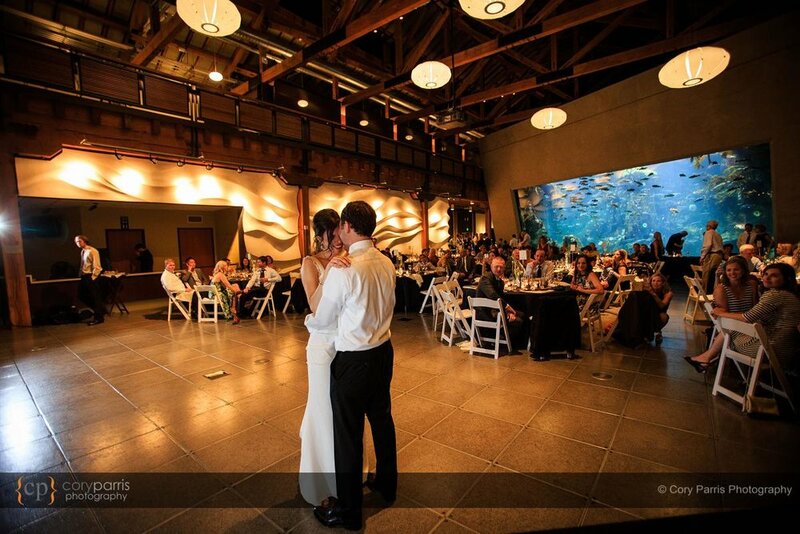 I love photographing weddings at the Seattle Aquarium. It is just non stop awesome photo opportunities. I could have chosen a hundred images for this blog post. Sunset portrait on the pier. Jesse hamming it up for the crowd after a kiss from his new wife. The siblings with an awesome toast/rap thing! Stephanie and Kalani's engagemnet portrait at Pike Place Market at Christmas time. Debbie and Philip met me down at Pike Place Market for some engagement portraits. I had a great time with them and we found some locations by the market that I hadn’t been to before. Very cool! I took this pair of portraits as Debbie and Philip looked at each other. 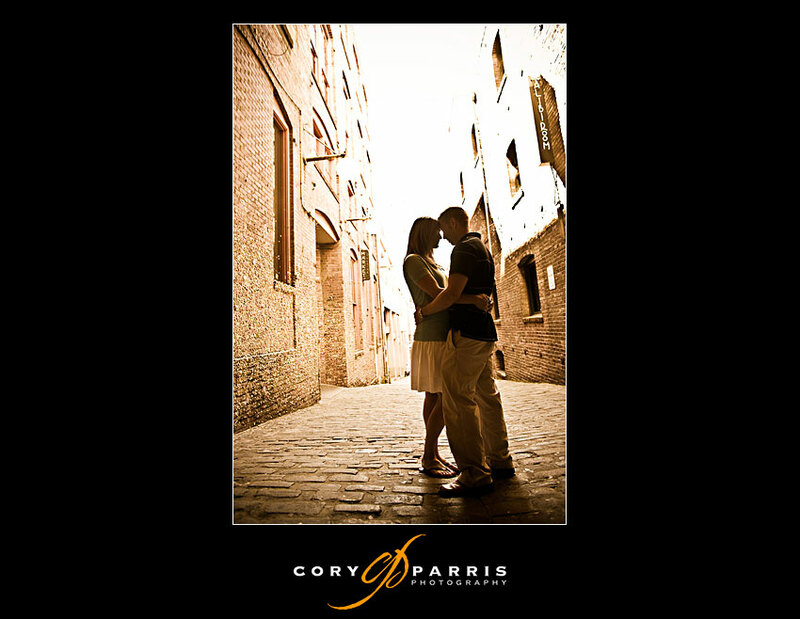 For this one, I used a flash to overpower the ambient light on a loading dock. I had a great time hanging out with Jen and Gregg taking portraits at Pike Place and the UW. Fun stuff. A note for photographers. The image above and the image below were created using flash with Radiopoppers. The main advantage to Radiopoppers in my mind is the ability to change the manual flash settings on the remote flash from the on-camera flash. Saves walking and pushing buttons! One more technical note for the photographer readers - All the images were processed in Lightroom and no commercial action sets were used. Here are a couple random images from Pike Place Market. I hate being late, so I was running through the market (as best I could through the slow moving pedestrians) to make sure I was on time to my portrait session with Jen and Gregg. Therefore, I took two images. Amazingly enough, I liked them both! 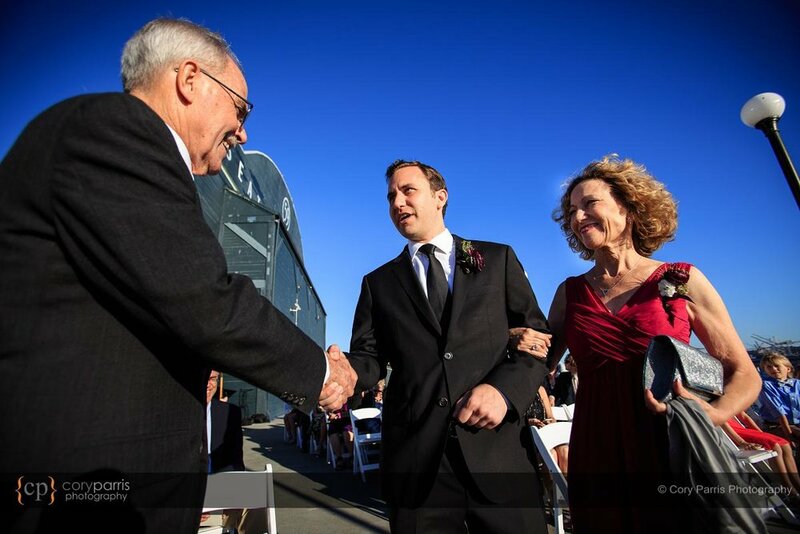 One of the great things about being a wedding photographer is the great variety of people I get to meet. Over the course of the years I've met doctors, lawyers, asphalt layers, seafood company executives, Microsofties, Googleites, Yahooligans, Amazonians (the book selling kind) tug boat owners, mechanics, diamond brokers, Hell's Angels members, sports stars, talk show hosts and the occasional reality tv personality. What I love even more is when people stay in touch. One case of that is Shanna Follansbee. She lives in Washington, D.C. with her husband, but her family lives in Eastern Washington. She called me about a year ago because she was writing a cookbook and needed some help with the photographs. I helped her process the images for her book. Also, on a trip to Seattle, she had me take some photographs for her book. Last week, I received the final version in the mail with my photographs on the front and back covers. Not only did she sign it for me, but she even thanked me on the dedication page! How cool. You can buy her fabulous book at Amazon. It includes some amazing recipes. One I'm looking forward to trying is the Seared Salmon with Fresh Corn Cakes and Avocado Salsa, but I might have to try the Grilled Mexican Spiced Pork Tenderloin with Goat Cheese-Stuffed Poblano and Tomatillo Sauce. Yum!